Investors got lulled into a state of inflation complacency. Persistently low official inflation rates in recent years depressed bond yields along with risk premiums on all financial assets. That’s changing in 2018. Five drivers of higher inflation rates are now starting to kick in. The Consumer Price Index (CPI) is a notoriously flawed measure of inflation. It tends to understate real-world price increases. Nevertheless, CPI is the most widely followed measure of inflation. When it moves up, so do inflation expectations by investors. On February 13th, the Labor Department released stronger than expected CPI numbers. Prices rose a robust 0.5% in January, with headline CPI coming in at 2.1% annualized (against expectations of 1.9%). In response to the inflationary tailwinds, precious metals and natural resource stocks rallied strongly, while the struggling U.S. bond market took another hit. Since peaking in mid-2016, the bond market has been stair-stepping lower (meaning yields are moving higher). In February, key technical levels were breached as 30-year Treasury yields surged above 3%. Some analysts are now calling a new secular rise in interest rates to be underway after more than three decades of generally falling rates. The last big surge in interest rates started in the mid 1970s and coincided with relentless “stagflation” and soaring precious metals prices. It wasn’t until interest rates hit double digit levels in the early 1980s that inflation was finally quelled, and gold and silver markets tamed. Rising nominal interest rates are bullish for inflationary assets such as precious metals so long as interest rates are following the lead of inflation rates. Only when interest rates get out ahead of inflation and turn positive in real terms are rising rates bearish. The Federal Reserve will face tremendous political pressure to keep its benchmark rate accommodative and also keep boatloads of bonds on its balance sheet in order to suppress long-term rates. Donald Trump has tied the success of his presidency to the level of the stock market like no other president has before. It started the very day after election night 2016, when markets experienced a dramatic reversal higher…and never looked back. Tax cuts, de-regulation, and plans for big infrastructure spending have helped stimulate the economy and equity markets. President Trump touted the stock market during his 2018 State of the Union address. But shortly thereafter the market got hit with heavy selling as Trump’s new handpicked Fed chairman took over at the central bank. You can bet Jerome Powell will feel the heat from the White House if his policies hurt the stock market. The path of least political resistance is keep inflating – especially given the government’s enormous and growing debt load. 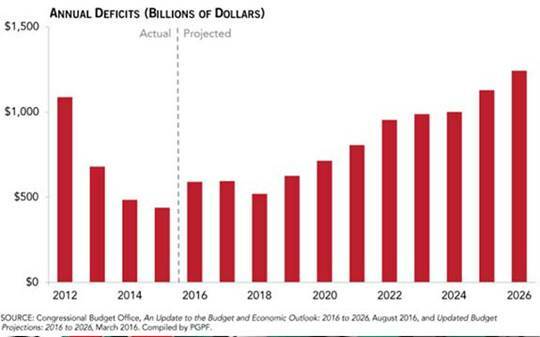 Trumponomics means greater economic stimulus….and larger budget deficits. The fiscal year ahead is now projected to deliver a funding gap of nearly $1 trillion (with future deficits expected to exceed $1 trillion). These new trillions in spending will just get charged to the national credit card. It currently has a balance of $21 trillion (not including tens of trillions of dollars more in off the book unfunded liabilities). All this new debt in a period of relative economic strength is setting up for a disaster when the economy eventually turns down and the deficits spike to unimaginable new highs. The Fed can keep printing the dollars needed to keep the government solvent. But at some point, the world may lose confidence in the devaluing currency in which all these federal IOUs are denominated. The gathering debt crisis virtually ensures there will be a dollar crisis – which means there will be a massive inflation spike to “pay” for the government’s otherwise unpayable debts. Commodity markets are cyclical in nature. When prices for a commodity are low, production falls. As new supplies diminish, the market tightens, and prices move higher. The higher prices incentivize producers to invest in production capacity and increase output. Eventually, the market becomes oversupplied, prices fall, and the cycle starts all over again. Where are we in the commodity cycle now? Most likely in the early stages of a major upswing. Precious metals, base metals, and crude oil have all moved up off their most recent respective cycle lows. Agricultural commodities have lagged but are gaining some upside momentum so far in 2018. The commodity markets slump from 2011-2016 caused investment in mining, drilling, and exploration to dry up. According to the International Energy Agency, new oil discoveries by 2016 sunk to their lowest number in decades. Meanwhile, gold, silver, and copper mines got “high graded” – leaving the most difficult and most expensive to process ore for future mining efforts that will only be viable with much higher prices. Right now, the cycle appears set to pressure metals prices higher. How much higher is unknowable. If renewed inflation fears drive investors into gold and silver markets for safety and later, speculation, prices could easily exceed the 2011 cycle highs by significant margins.